McKay Creek is a key tributary of the lower Crooked River. It flows for 37 miles from its headwaters in the Ochoco National Forest to its confluence with the Lower Crooked River downstream of Prineville. The upper twenty-five miles flow through the National Forest and the lower twelve miles flow through private agricultural land. The creek supports a robust population of redband trout and is a critical tributary for the reintroduction of summer steelhead above the Pelton Round Butte Dam. The DRC is partnering with McKay Creek farmers and Ochoco Irrigation District on the McKay Creek Water Rights Switch, a project that restores natural flow to McKay Creek while providing farmers with a more reliable water right from a different source. The DRC is also partnering with the Crooked River Watershed Council and local landowners to design and implement a comprehensive restoration strategy for the creek. McKay Creek flows 37 miles from its headwaters in the Ochoco National Forest, through private agricultural lands, and joins the Crooked River just northwest of Prineville in Crook County. The dominant private land use along the creek is livestock and irrigated forage production, using water from the creek. Due in part to irrigation diversions, flows are low or intermittent in the middle reach during the irrigation season, limiting fish movement and contributing to insufficient aquatic habitat, resulting in high stream temperatures. 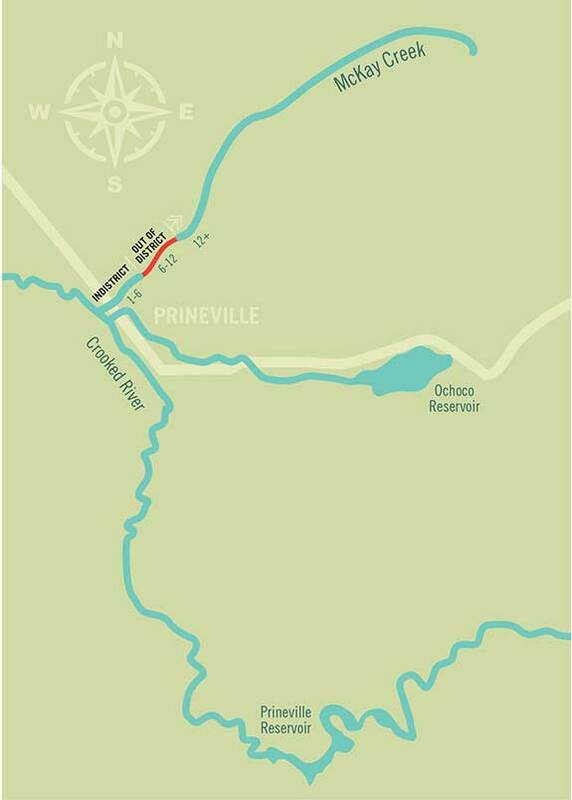 The McKay Creek Water Rights Switch (the Switch) will restore natural flow to the middle reach of McKay Creek by allowing landowners from river miles 6 to 12 to trade their private McKay Creek water rights for Ochoco Irrigation District (OID) water rights, sourced from Prineville Reservoir. In exchange for more reliable OID water, landowners will transfer 11.2 CFS of certificated McKay Creek water rights instream. Restoring the natural hydrograph in this reach of McKay Creek will address many limiting factors, including low flow, altered hydrology, high water temperature and impaired fish passage. Water users from the confluence of McKay Creek and the Crooked River to approximately river mile 6 are patrons of OID and serviced with water from Prineville Reservoir. This reach of the creek does not experience low stream-flows, due in part to the return of irrigation water to the creek. Water users from approximately river mile 6 to river mile 12 divert water directly from McKay Creek contributing to critically low and intermittent streamflow conditions earlier in the summer than would naturally occur. These diversions can create fish passage barriers and contribute to high stream temperatures. 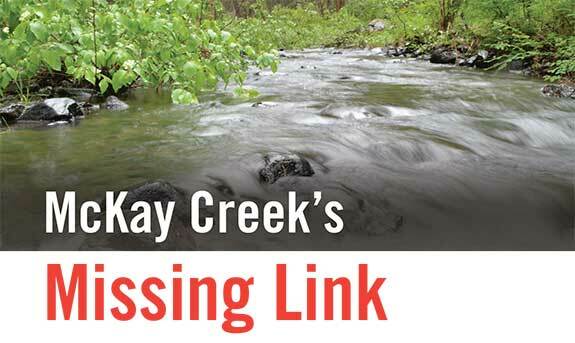 Removing all private irrigation diversions from McKay Creek eliminates the need for diversion structures that create passage barriers for migrating fish and optimizes habitat restoration and land conservation opportunities. Protect water restored to McKay Creek from Forest Service floodplain restoration projects upstream of the Switch. Provide opportunities for riparian land conservation with the Deschutes Land Trust and habitat restoration opportunities with the Crooked River Watershed Council.